It’s a bracingly cold January afternoon, and the sun is strong – a wonderful winters day. Nature is at its most peaceful at Aman Bagh at this time of the year – winter is a relatively laid back season as the busy planting season is over, and life moves at a happy, slow pace as we wait in anticipation of the harvesting season in March & April. This is the Rabi – spring in Arabic – crop. The desi (MP tall 352) Gehun was sown mid November and is now one foot high – and healthy. It’s 2 acres of a quiet and sweet green, balm to the eyes and the soul. 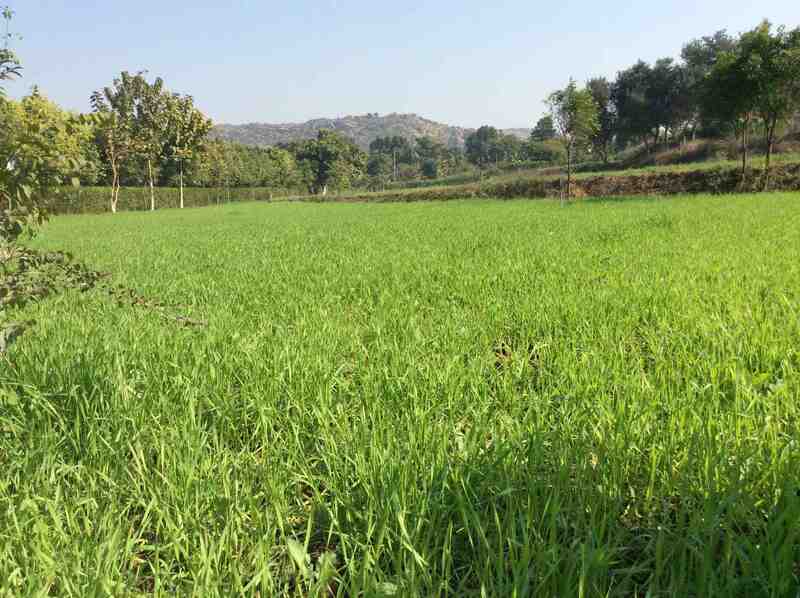 Our desi Sarson was sown on 1 November and is already 5 foot high, each plant with thick and strong stems; flowering bright mustard. 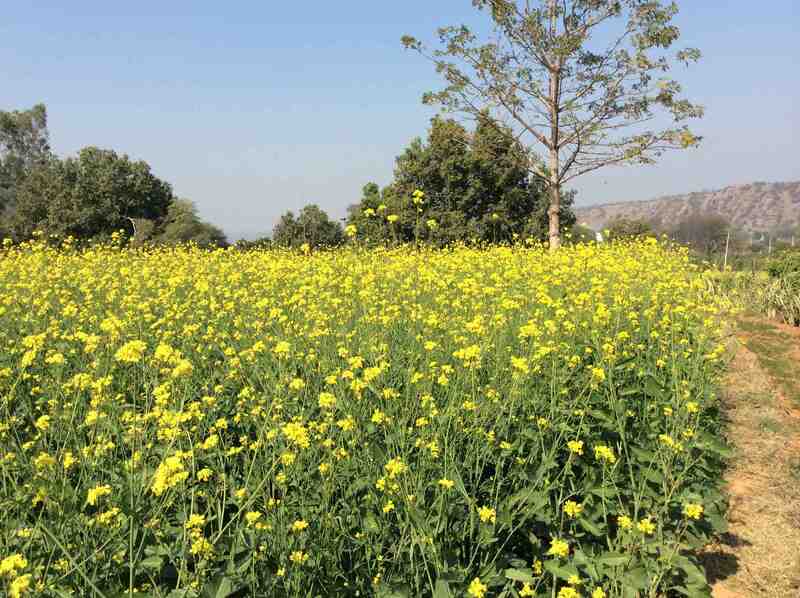 Nothing quite as beautiful as ripening mustard, heavy with flower, swaying in unison with the winter breeze. Many peacocks and peahens walk around, enjoying the safe haven of Aman Bagh. Jau was planted end October in a smaller patch, and has grown to 1½ feet; it will reach 4 feet by March when it would have ripened. Desi Chana (Kabuli & Black) was sown at the same time as Sarson; these too are doing well with tiny leaves spreading out from their low, thick clumps. 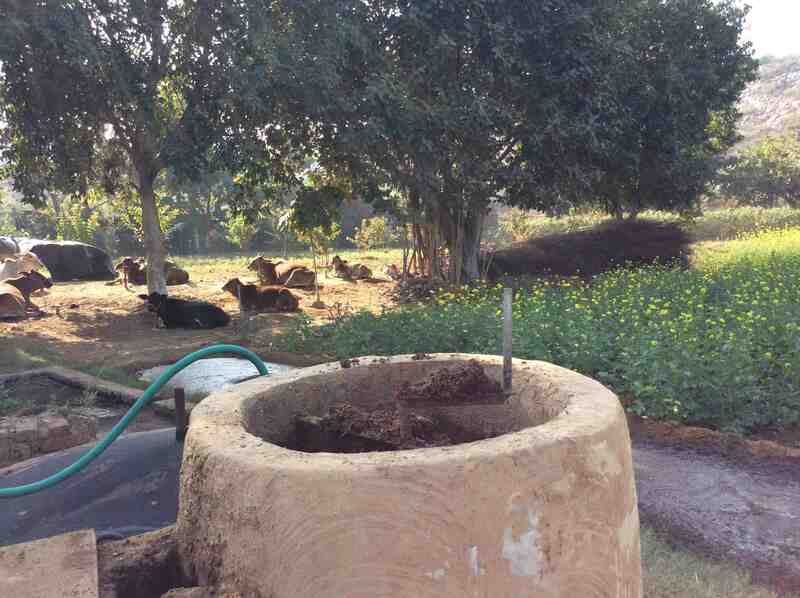 Other green growth (doob, chatmatri, khandimandi, papra, bathua, kharatua) was removed today and – other than kharatua – have all been fed to our cows as nyar, with the chana standing clean and free in the field. The Amrood trees are 18 months old and 10 feet high with thick central stems and balanced side branches, and gave us a few sweet fruits last summer and this winter. They now all have new lilac coloured shoots and leaves, the effect of winter and sufficient water & manure; and we look forward to their crop of Safeda fruits in the coming monsoon. Our mature Aam and Chakotra trees are in hibernation, waiting for warm February to flower; the 18 months old citrus – Kagzi & Bara Nimbu, Chakotra, and Kinnow – saplings have given off early winter shoots; but are yet one year away from first fruiting. The soil these healthy crops & fruit trees are growing on was fed manure (2 tonnes for every acre) from our 10 heads of desi cows, bullocks and their young ones. Besides the traditional talent my local farm hands possess in terms of knowing how and when to sow and water the crops, the health of these crops and trees is without doubt due to our liberal use of cow dung manure & leaf compost and the many by products used as micro-organism soil re-chargers and organic pesticides. It’s cold, windy and quieter as the sun sets and everyone hunkers down for another freezing January night in Faridabad – it will be 2 degrees Centigrade tonight. The plants and trees wait silently for February, without complaints as we have fed them with adequate nutrition and love. This entry was posted in A Day in The Life, Crops, Links to Organic Farming. Bookmark the permalink. Nostalgic, reminds me of the days when I accompanied my father to his school in a village called Lakhon-ke-berham, about 20 kms from Ferozepur and his very devoted and commited peon used to take me to the fields to give ‘the city boy’ a tour. I very well remember Sarsoan and sugar cane. Thank you for making me relive those moments.